A beautiful antique high stem Shisou censer with his original base and cover, inlaid with a archaistic pattern and stylized taotie masks, cast with a pair of stylized lion head mask handles. Private Collection (Paris / France). 18th or early 19th century. Bronze inlaid with silver or gold wires. The total height is about 7.9 inch tall (20 cm). The wooden cover is repaired, see photos. We never end auctions early, please do not ask, thank you. Netherlands : 1 week Europe : 2 weeks Outside Europe : 4 - 6 weeks (sometimes Earlier). It is safer and faster! Good communication is the best way to solve any issues. 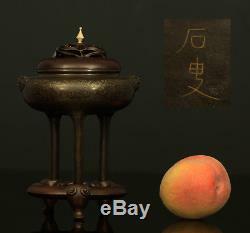 The item "A RARE antique CHINESE SHISHOU BRONZE CENSER YUTANG MARK 1800 SUPER RARE" is in sale since Thursday, January 10, 2019. This item is in the category "Antiques\Asian Antiques\China\Incense Burners". The seller is "ancient-arts" and is located in Breda. This item can be shipped worldwide.